WHEW! I've been working VERY hard on this one! Math facts are something that have always been challenging for my students, so I decided to create some resources to allow for a solid, engaging, and exciting math fact routine in my classroom. 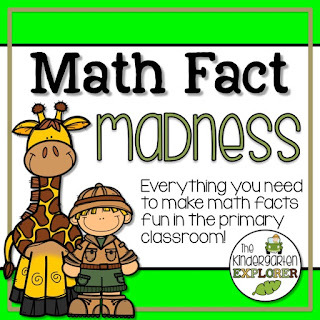 Introducing MATH FACT MADNESS! 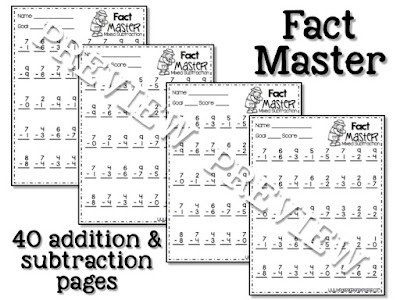 These worksheets are an excellent way to drill and practice math facts in your classroom. 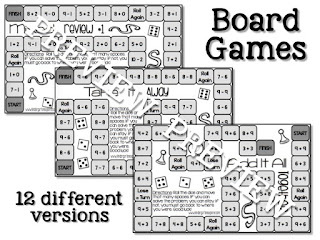 Each sheet introduces a new addend or subtrahend. For example, the first page is every digit plus 0, then every digit plus 1, etc. After each addend or subtrahend is introduced, there are two practiced at a time. Finally, there are 3 pages or mixed review for addition and subtraction. A total of 40 pages in all! With a total of 12 different board games to choose from, these can be used daily during math centers and your students will NEVER get bored! Addition and subtraction facts are introduced a few at a time, and there are games for mixed addition and mixed subtraction, as well as doubles. Always a student favorite in my classroom, 24 math facts are hidden around the classroom. As students find the facts, they record the fact and answer it on the provided recording sheet. Answer keys are also provided, in case you can't find the fact once you've hidden it! 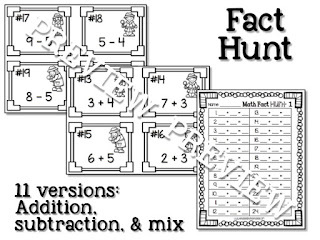 A total of 11 different addition, subtraction, and MIXED addition/subtraction fact hunts will keep your students busy and engaged! 18 different cut and paste worksheets are provided where students solve problems and glue them under the corresponding answer. 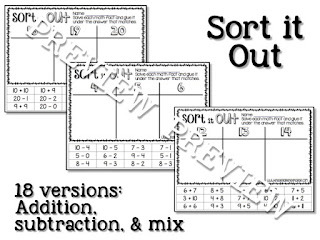 Addition versions, subtraction versions, and mixed addition/subtraction versions are all included. Flashcards for EVERY single-digit addition and subtraction fact are included. These can be copied 2-sided so answers appear on the back. In my classroom, these are used to create math fact rings for students to take home, and I also keep a few sets in the classroom for daily partner practice. Follow the link on the side of my blog, or click on any of the pictures to find this in my TPT shop! I hope these pages are just as useful for you as they are in my own classroom!